NEWINGTON - Kids, get ready to start hunting for Easter eggs. 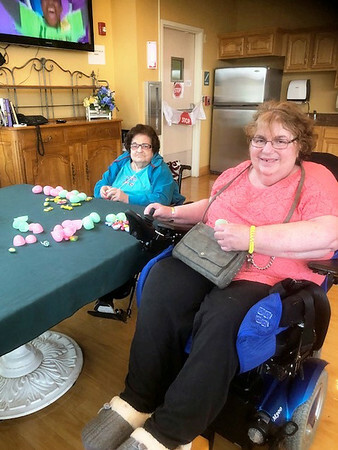 The candy-filled treats were stuffed by the hundred inside Bel-Air Manor Nursing and Rehabilitation Center this week. 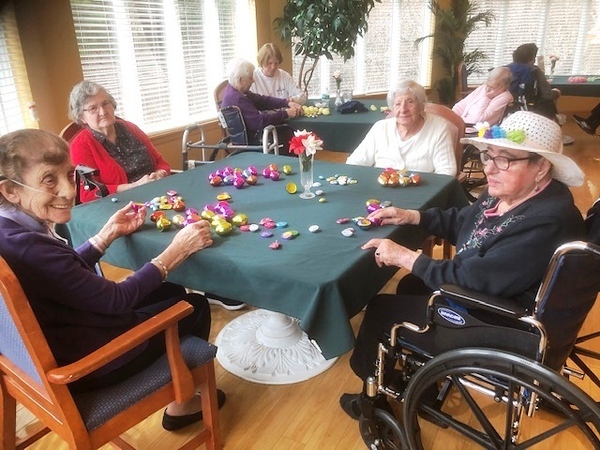 The nursing home at 256 New Britain Ave. is hosting an Easter Egg Hunt for the community this Sunday, April 14, at 10:30 a.m.
Bel-Air Therapeutic Recre-ation Director Sue LePage expects a big crowd. She reached out to Annunciation Parish, composed of St. Mary Church and the Church of the Holy Spirit, along with the Lucy Robbins Welles Library. The grandchildren of Bel-Air residents have also been invited to participate. As of Monday, 250 eggs had already been prepared and another workshop was set for Wednesday. “I want this to be an annual thing starting this year,” LePage said. If the weather is good Sunday, the hunt will be held on the property outdoors. 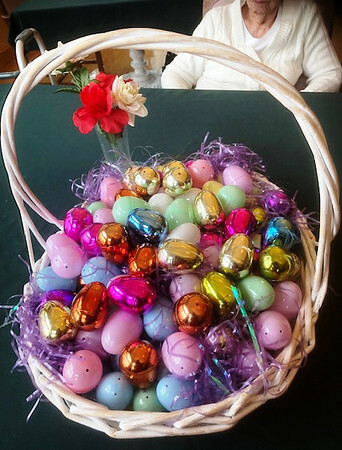 If it rains, kids ages five to eight will hunt for eggs in Bel-Air’s rotunda room and those under age five will have a separate event in another room. The Easter Bunny is even expected to make an appearance. Another special guest will be “Vitality Archaeologist” Kathy Gregory, a musical entertainer who will play the guitar and other instruments and sing songs befitting the Easter theme. Cookies, juice and other kid-friendly refreshments will be served. Bel-Air specializes in short-term rehabilitation, nursing back to health patients who have suffered strokes, heart attacks or are recovering from surgeries. Long-term care is provided in a separate wing. As they filled the colorful plastic eggs with candy this week, Bel-Air residents chuckled together. Sitting at her table was Angela Sipela, a friend and fellow resident. Easter Sunday is the following weekend, April 21. Bel-Air is hosting a formal dinner for residents and their families. Stew Leonard’s Newington store is also getting into the holiday spirit. Its Annual Easter Egg-Stravaganza is set for Tuesday, April 16, from 4 to 5 p.m. Kids will use handheld maps to navigate the store, meeting costumed animal characters and collecting Easter treats along the way. Two eggs will contain the top prizes: $50 gift cards to Build-A-Bear and Barnes & Noble. The event is free and open to children ages eight and under, with tickets required. Register at eventbrite.com. Posted in Newington Town Crier, Newington News on Thursday, 11 April 2019 08:35. Updated: Thursday, 11 April 2019 08:38.